Smoke and flames cover acres of land near the Santa Ana river bottom in Riverside on Thursday, Dec. 21, 2017. 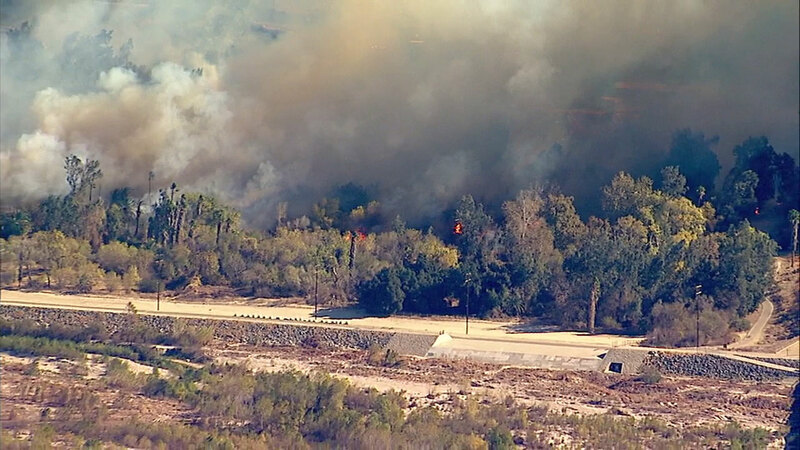 Firefighters are battling a fast-moving brush fire spreading quickly amid windy conditions not far from downtown Riverside. The fire was reported near Mission Inn Avenue and the Santa Ana river bottom, according to Riverside fire officials. Mandatory evacuations were underway, but the locations were not immediately announced. An evacuation center was being set up at Dale Senior Center, located at 3936 Chestnut Street. Large plumes of smoke were seen rising from the flames as winds up to 40 mph blew northeast.